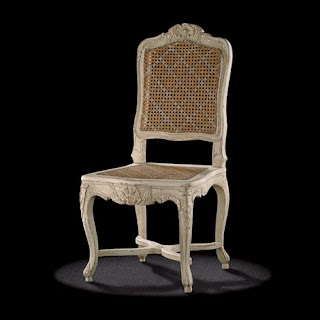 Parisian Regence chair, circa 1740, in the Rocaille style in vogue early in the reign of Louis XV. 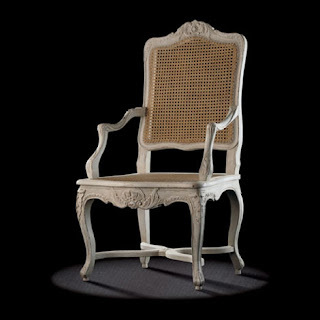 Dimensions of Antique Regence Rocaille Chair : 100 h x 50 w x 45 d cm. 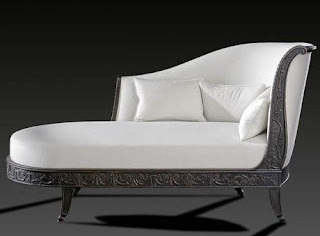 The characteristics of this antique Regence chair and armchair are present here - no deep mouldings, carvings of medium depth, rocaille elements (in the centre of the stretchers, on the legs and on the edges of the rails and the back). This chair has a stretcher, as does the matching armchair (RTF1) which is quite frequently found on this type of model, which is simple and elegant. It is fully-caned, as was dictated by the fashion of the time. 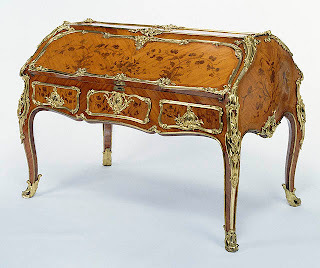 Antique Regence Chairs and Armchairs which are reproduction antique like this are rather rare (very few bear a stamp, as they are earlier than 1743).